NECKLACES CAN BE MADE IN ANY LENGTH YOU WANT. IF YOUR LENGTH OPTION IS NOT LISTED, PLEASE LET US KNOW AND WE WILL SEND YOU A PRIVATE LISTING. This post is for Part #41, known as a "Cross Chain" by name. It is made of 100% pure surgical stainless steel. It measures 4.0mm (millimeters) thick. For those of you who need a better idea of its size, we used a common U.S. quarter in the pictures attached to this post. 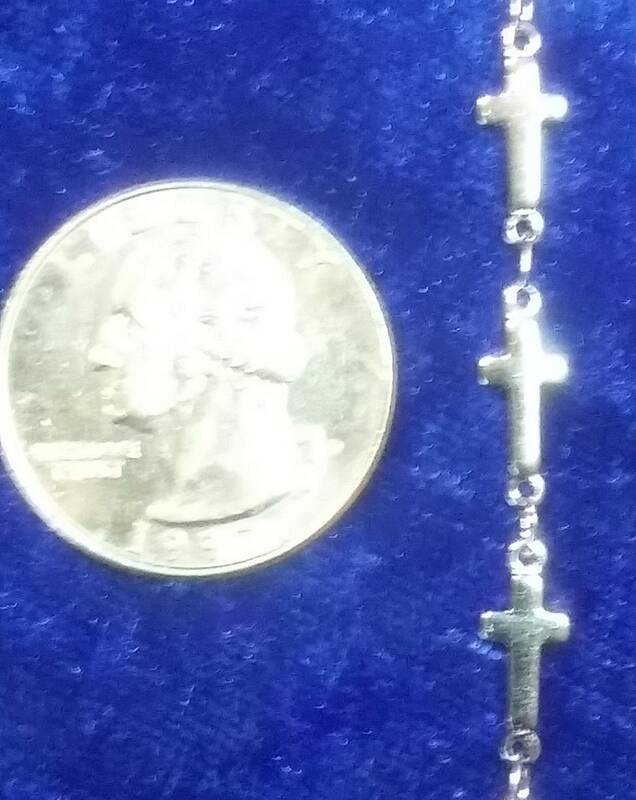 We apologize for the fuzziness in the attached pictures, but it's difficult to take good photographs of chain this size. This chain is entirely silver in color, though the pictures don't do it justice! The chain design is made up of a lot of small, but very strong evenly round links. We will cut your chain by the inch lengths you order. Then add the necessary matching rings and clasps, so that you can wear your chain right out of the package when you receive it. PLEASE let us know if you prefer to connect and disconnect your chain with either your right or left hand, so she'll know which end to add your clasp to. If the size you would like is not listed please email us at tntptp [!at] gmail.com and we will create a private listing for the size you would like. Pure stainless steel is among the strongest metals used for making jewelry. The links on this chain need to be put under a tremendous amount of pressure before they would snap or break. The bindings or clasps will break WELL before the chain will. Another great thing about stainless steel with necklaces or bracelets is that it will NEVER tarnish through normal wear over time. This also means that it won't discolor your skin like a lot of the standard metal alloy jewelry does quite frequently. Further, you'll spend a LOT less time polishing and/or cleaning it up, too! For every 20-inch or longer regular priced chain you purchase from us here in this store, you qualify for a $5.00 discount off the listed price of any of our regular priced pendants here in our Etsy store. The only "catch" is that you must purchase and pay for your pendant at the same time you purchase your 20-inch minimum length necklace chain. LIMIT: One discounted pendant per 20-inch necklace chain purchased. EXAMPLE: If you see a pendant option we have posted on this site, you can receive it at $5.00 off what you see it listed for here in our Etsy store, because this chain is listed as already cut for at least 20 inches in length. Simply purchase this chain plus the pendant option you want, and submit your payment for both. We will then issue your account a $5.00 partial refund to accommodate you for your qualifying discount. Bob and Kristi are awesome, great communication from start to finish! I am a Red Sox fan, not a Yankees fan, but this is a gift for a friend that likes the Yankees. I can't wait to see his reaction to this awesome flask!! !